This small family restaurant has been running for quite a long time now. Each generation has taken over and kept the tradition going. The concept of the restaurant is based on Mongolian history. Once a battle was won, Mongolian soldiers used to cook their meal on their shields, over a fire. Quite an interesting thing to do. Kublai has a buffet with a selection of frozen meats, vegetables and sauces. You add the meat to a bowl, chuck in some vegetables and top it all up with some sauces. Then, you hand it through a little window, where two men are standing around what looks like a massive piece of charcoal. 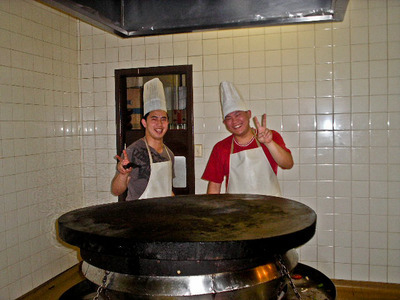 This is a big hot plate, which represents the Mongolian soldiers' shields. Within seconds your Mongolian stir-fry barbecue will be ready. When I went, I remember we ordered two rice dishes for four of us and we chose the unlimited option which allows you to help yourself as many times as you want. I went back twice to try a different combination. But trust me unlimited has a limit. It wasn't that expensive and the food was really good. It's also fun to go around picking your own ingredients. I reckon the taste is all in the sauce selection. And for the chili addicts, the chili is pretty hot. I dare you to try it. The décor is pretty basic, almost none actually. The environment is pretty chilled, very quiet. Everyone is doing their own thing, choosing their food combinations and enjoying the barbecue show. I've read many bad reviews about this restaurant, and I don't know why that is. I was thinking, it might be because some people go there expecting some kind of fine dining. Of course that would be disappointing. But I had no expectations and I always have an open mind, so when I left I was quite satisfied about what I had. I really recommend Kublai, at least once.